Wow. That was really exciting! 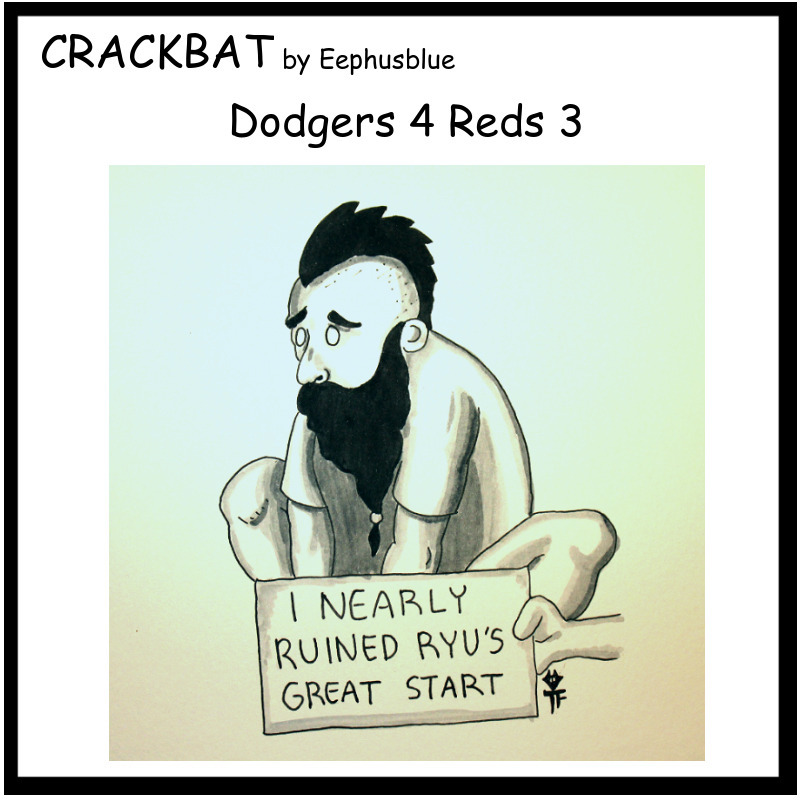 For a moment, it looked like Ryu might actually top Beckett’s no hitter from Sunday with a perfect game. Through seven innings, Ryu set down 21 straight Reds. No one reached base which is saying something for this defense that seems to have an error every game. Unfortunately, after a long bottom half of the seventh in which the Dodgers scored 3 runs, the pefecto came to an end in the eighth off a Todd Frazier double. Then the wheels started to come off as Ryu allowed a single, sac fly, and another single before being lifted for Brian Wilson. Oh Brian. What are we going to do with you? Donnie says you aren’t any good with a huge lead because you need that adrenaline rush of a tight game. Well this was it. And…..uh…..it didn’t go so well. Brian got Devin Mesoraco to strike out (hooray) but then walked Skip Schumaker (really?!?) to load the bases and then gave up a (nearly) bases clearing double to Billy Hamilton making it 4-3. Thanks largely to Yasiel Puig doing Yasiel Puig things and getting the ball back into the infield (to the cut off man no less) the tying run did not score. Then Brian walked Zack Cozart on 4 pitches (though he did touch 95) to load the bases AGAIN. So much for Donnie’s explanation for Wilson’s struggles. Fortunately for all, Kenley came in to clean up that mess and save the day pitching a 4 out save. Hooray Kenley! I really don’t know what to do with Wilson. He is most likely coming back next season so its in all our interests to fix whatever the hell is plaguing him. Brandon League 2.0 here we come…..hopefully. Donnie is desperate for any fix with Brian, resorting here to dog shaming him. Aw. Silly Brian. Made a mess of that wonderful Ryu start. Well how about that? How many of you pegged Josh Beckett as the first Dodger pitcher to throw a no hitter since Nomo did it way back when? Not me. I totally had my money on Paul Maholm. But Beckett again provided a solid performance and baffled the Phillies yesterday while only issuing three walks. It looks like this resurgence is due largely in part to a heavier use of his curve ball. The decision to make that adjustment is chronicled in a great article by Pedro Moura here. 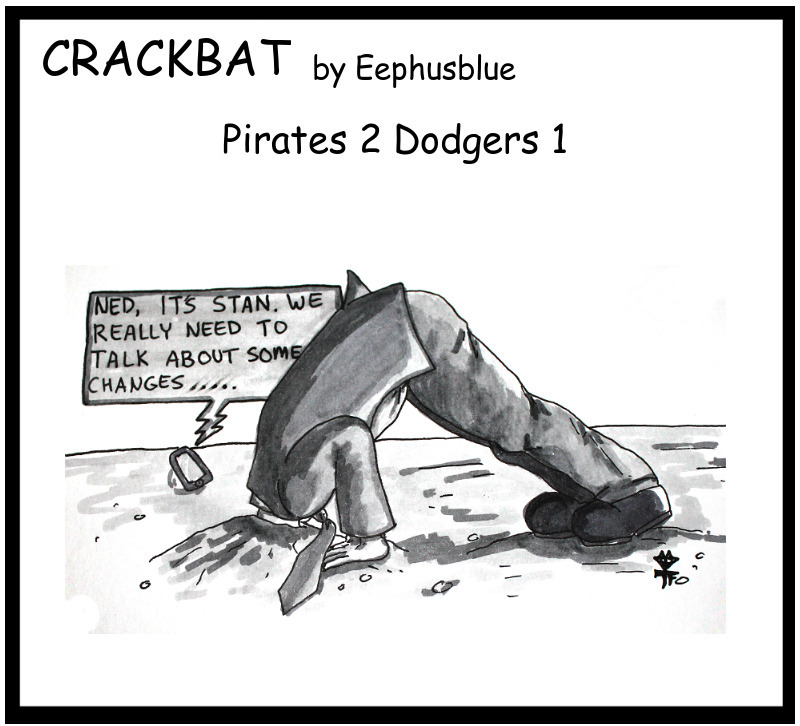 Give it a read when you get the chance as its interesting stuff and again proves how awesome AJ Ellis is. The bats also decided to show up to back Beckett’s no hitter, taking it to the Phillies to the tune of 6 runs over 11 hits. And miracle of miracles! No errors. That’s a nice change of pace. In fact even Erisbel Arruebarrena managed to collect two hits while providing some stellar defense at short. I haz the happies. If only he could hit enough to continue at SS and shift Hanley over to third. Eh. Maybe eventually. I commented on twitter how that no hitter probably does not happen with Hanley at SS. Somehow, the ball would have gotten through and be scored a hit. Also hey lets be happy that the bullpen didn’t give up any hits or runs yesterday!!!! woooooooo! 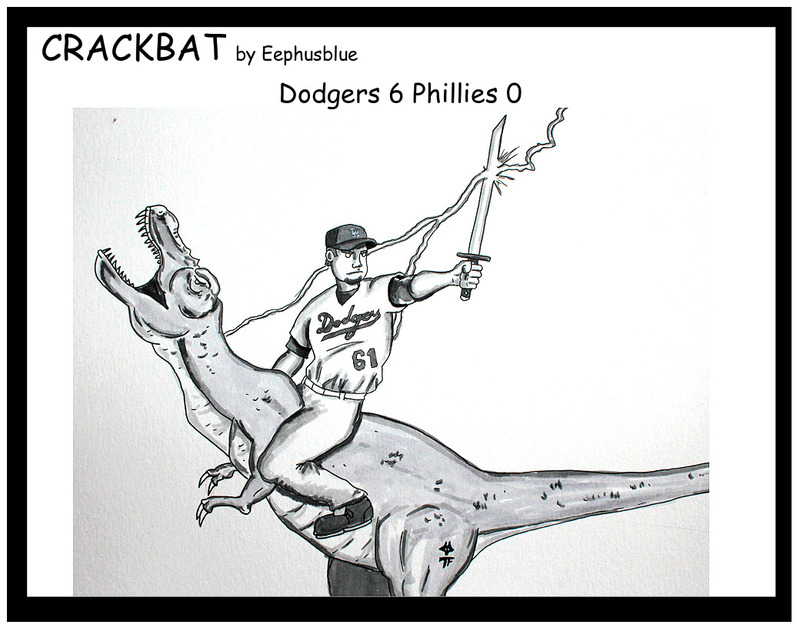 On his off days when he isn’t throwing no hitters, Josh likes to take his T-Rex out for a spin and collect lightning with his sword. True story. RECAP: The Bats show up, Beckett decent, Olivo hungry. 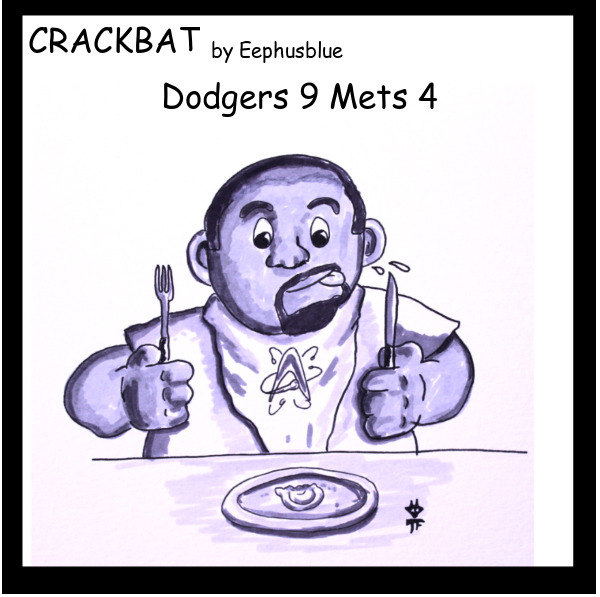 Dodgers top Mets 9 to 4. So that was a fun game. 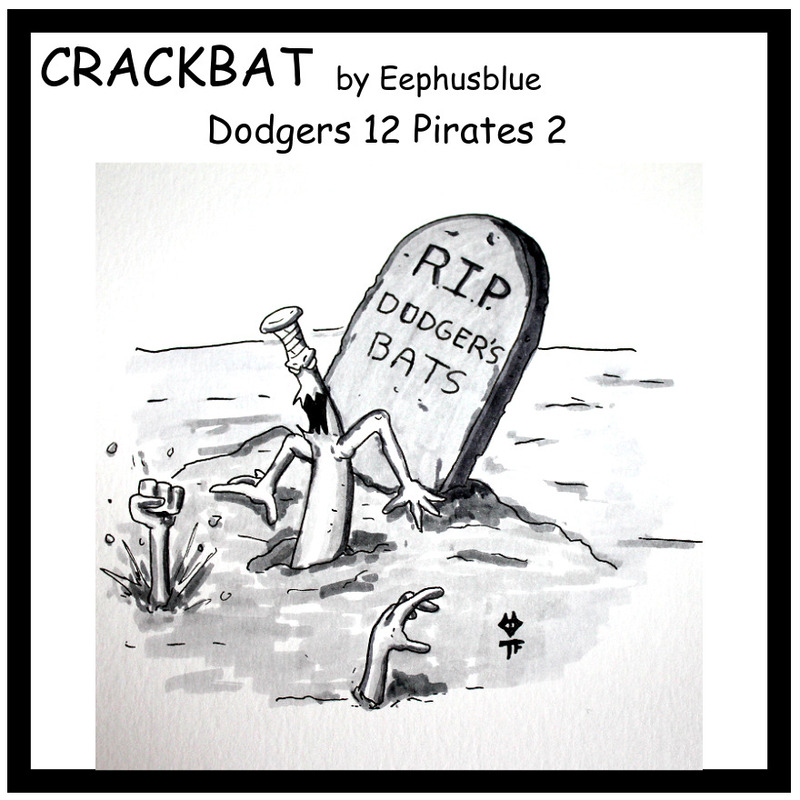 Dodgers’ bats showed up and beat the Mets. Beckett was decent for the most part but did surrender 4 runs. Good thing those bats showed up. But the big news of the day was Miguel Olivo and his hunger. For who the hell knows why, Miguel sucker punched Alexander Guerrero and then proceeded to gnaw on his left ear. Reports are coming out that he will be out for 3-5 weeks recovering after said ear needed to be reattached. Might want to give him a rabies shot just in case. I had some ideas for longer comics and I may revisit them when I have some time. In the meantime, here is Miguel enjoying a nice bit of roasted Guerrero. Man what an awful series. There seem to be a lot of those lately. Anyhoo at least it inspired me to make a funny comic. Done in the Peanuts style. 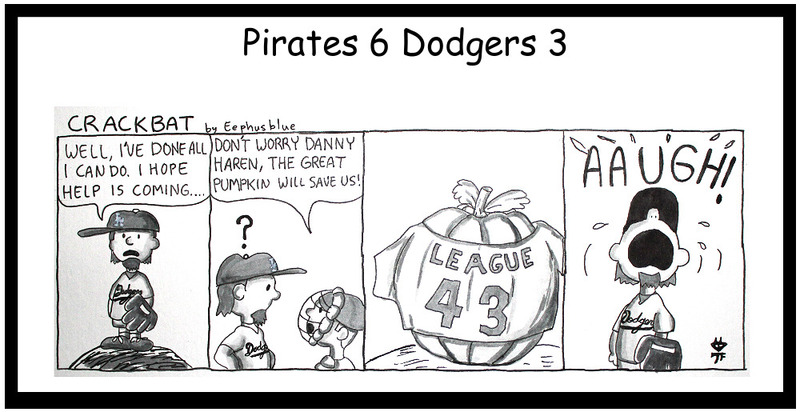 I just couldn’t shake the image of Dan Haren getting knocked off the mound by hard hit balls.